This afternoon we went out for a short family walk in Crummack Dale with friends and here's a quick photo looking across upper Crummack Dale. After yesterday's surprisingly good weather, it was perhaps no surprise that the overnight rain had yet to clear when I set off walking in full waterproofs at around quarter to nine this morning. When I reached the river it was clear that the rain had been heavy last night as the river was now even more swollen than yesterday with a couple of sections of slightly flooded path to negotiate. I passed Loup Scar on the far side of the rapidly flowing river and continued on upstream, slightly drier now that the rain had stopped. Soon I reached a footbridge, which I crossed to reach the north bank and slightly calmer waters. Two to three kilometres of walking westwards brought me to the impressive white water of Linton Falls. The footbridge just above the falls allowed me to get a good view of the huge volume of water tumbling down the falls below. By now it had started raining again so I continued on upstream past a weir to reach the busy market town of Grassington, where I stopped for a bite to eat on a handy bench in the town square. Grassington marked the point that I left the river behind for the moorland to the east of Wharfedale. I ascended northwards out of town on a good track, which became a grassy path after around a kilometre. By now it was dry again and there were good views across northwards and westwards as I continued across the pleasant grassy moorland of Lea Green, with occasional areas of limestone pavement, past a 150 year old Lime Kiln before reaching Scot House Lane. Here a puzzling footpath sign seemed to indicate a right of way down through the crags below to the left. Unfortunately although it looked interesting I was up against the clock if I was going to reach Buckden in time for the mid afternoon bus; therefore I left any exploration for another day. 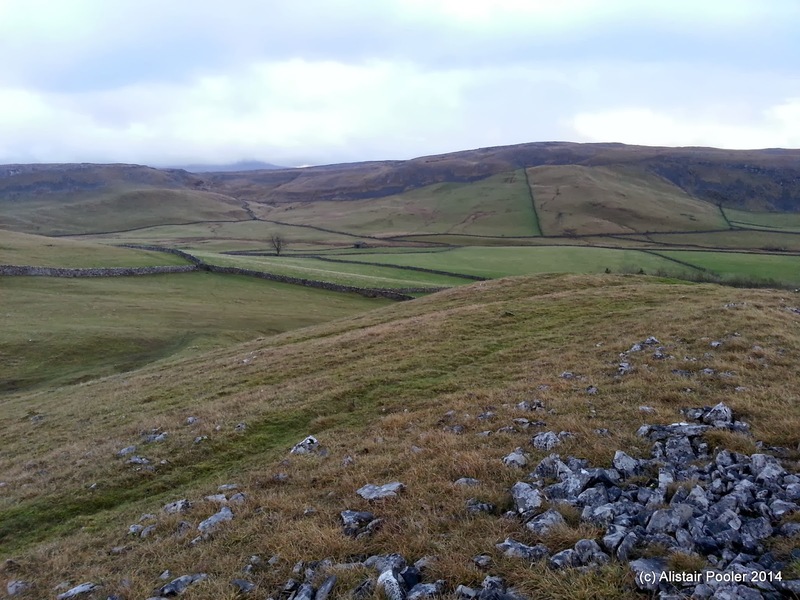 There were good views across Wharfedale towards Knipe Scar, which marks the end of the long ridge that extends SE from Birks Fell (on whose summit I finished the 2000ft peaks of the Yorkshire Dales). Soon the rain started again, so I sought shelter in some woods in an attempt to stay dry whilst eating lunch. To save time I opted to follow the road into Kettlewell before picking up a footpath again on the west bank of the Wharfe. By now it was 1:30pm, so it was clearly going to be touch and go whether or not I'd make my planned bus from Kettlewell; therefore I quickened my pace along the riverside footpath. The ground was quite damp in places, with occasional sections of flooded field to negotiate. I passed a number of barns on the way to the Starbotton footbridge, which I reached at quarter past two - things were now looking better for catching the bus from Kettlewell so I continued on up the valley. The walk to Buckden passed without incident, although it was quite muddy in places with flood debris evident along some of the river bank. In the end I made it to the bus stop a whole five minutes early! Soon I was on the warm bus starting my four hour return journey home via Skipton, Leeds and Manchester. It had been a good couple of days of mainly low level walking and I plan to return to complete the remainder of the Dales Way at some point. I had been toying with the idea of walking the Dales Way for a while now, and this weekend seemed to be a good opportunity to walk a couple of days of it. Therefore early this Sunday morning I caught a train across the Pennines to Leeds and then onto Ilkley, from where I set off walking at around quarter to ten. Soon I reached the start of the Dales Way at Ilkley Bridge. I headed west out of town, past a tennis club and across riverside fields with glimpses of sunshine. The river looked to be quite full, presumably from all the recent rain - and it was forecast to rain some more later this afternoon. This path seemed to be popular with joggers as I met a fair few between Ilkley and where the path joins the road 2km west of the town. Around a kilometre of minor roads lead me to the attractive cottages of Low Mill Village and onwards to pass St Peter's Church, whose interior dates from Tudor times according to the handy nearby sign. 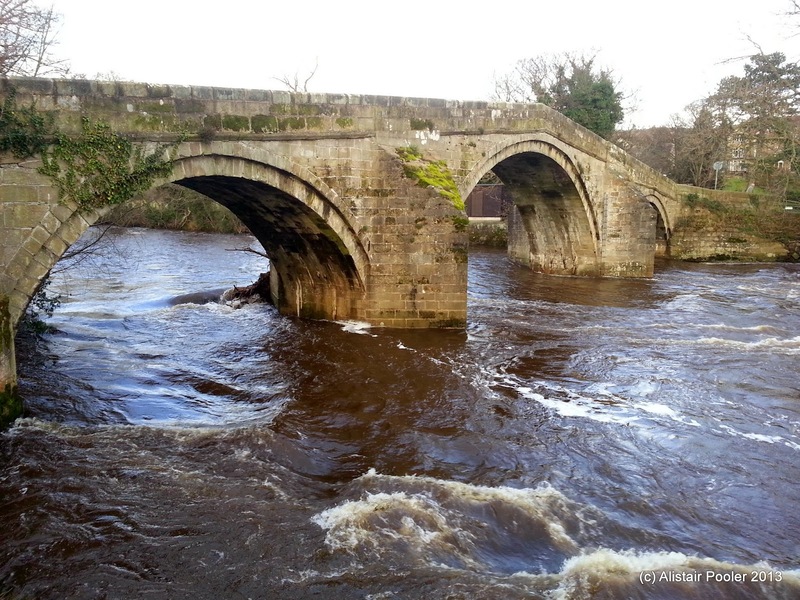 A short walk through the eastern edge of the village of Addingham brought me back down to the River Wharfe. After passing through a caravan park there was now a pleasant couple of kilometres of riverside walking through sheep fields. This ended when I reached the B6160 road, which I crossed to find the Farfield Friends Meeting House that dates from 1689. A field edge footpath offered a pleasant alternative to walking along the road for the next kilometre, but unfortunately it seems to end prematurely, which results in having to walk along the busy B6160 road for around half a kilometre before escaping back down to the river again. At Bolton Bridge, where I entered the Yorkshire Dales National Park, there were good views further up into Wharfedale. Continuing on upstream, on the west bank of the River Wharfe, I entered the pleasant parkland of the Bolton Abbey estate where I soon stopped for lunch on a handily located bench in the winter sunshine. After a little over a kilometre of enjoyable riverside walking I reached the impressive remains of Bolton Priory, which dates from the 12th century. I took five or ten minutes out of my walk to have a quick look around the ruins of the priory, before crossing to the east bank of the Wharfe by way of Waterfall Bridge. The next couple of kilometres were clearly a popular spot for a Sunday afternoon stroll as I reckon I passed at least a hundred other walkers! Around a kilometre and a half after passing the priory, I reached a very busy car park next to the Cavendish Pavilion cafe and visitor centre. The reason for the busy car park soon became apparent as I entered Strid Wood: the estate was holding a Christmas event along the next few hundred metres of woodland path, complete with elves and Santa's grotto! However given the I didn't have Isabel or Olivia with me there was no need to stop, so I continued onwards along the Green Trail to reach The Strid. This significant narrowing of the river was impressive to look at today given how full the river was, and it reminded me slightly of the Linn of Dee (although with a few more trees!). However the river looked to be very dangerous here so, as advised by the signs, I kept well back from the edge whilst admiring the awesome force of the river being forced through such a narrow gap. Continuing on through the woods I reached Barden Bridge. Here I seemed to leave the crowds behind as from here on I only saw a handful of other walkers for the rest of the day. It was a pleasant sunny afternoon as I continued northwards along the east bank of the river towards Appletreewick.